Some people have heard me insist that writers should watch foreign films, not just American films, to get a more well-rounded view of storytelling. The best classroom for that this week was in Palm Springs. The Palm Springs International Film Festival, wrapping up this weekend, boasts that it screened 180 films from 60 countries this year, including 40 of the 80 foreign language entries for this year’s Academy Awards®. Judging by conversations overheard during the patience-testing amount of time waiting in line for screenings, the shuttle, the bathroom or for a beverage, festival goers really take advantage of the opportunity to see films from and about countries that they wouldn’t normally see in their local theaters. As one woman noted as we were filing out of a screening of “Mountains May Depart,” she doesn’t normally get to see many Chinese films. I had to agree. I love foreign films and yet I admit to watching very few Chinese films. “Mountains May Depart,” which premiered at the Cannes film festival last year, takes place in China and Australia over the course of several decades, starting in the past and going into the future (lots of handy gadgets, yet vinyl prevails!). Focused on a woman named Tao, the story begins with her choosing between two strikingly different suitors: one blue collar buddy who adores her and one wealthy proprietor who wants her probably because everyone else does, like some kind of prize. The story continues with the consequences of her decision, leading up to her adult son’s estrangement from her and from their heritage and language. It’s a film that’s longer than it needs to be, but the time-jumping structure is interesting, because it forces the audience to make some assumptions about what’s transpired. A more traditional narrative structure plays out in the Venezuela-set “Liz in September.” The title character is a beautiful model attempting to hide her terminal cancer. Liz, played by the luminous Patricia Velasquez (remember Marta in “Arrested Development?”), is a lesbian on what seems like an endless vacation in a secluded resort with a cadre of her lesbian friends, which includes at least one jilted ex-girlfriend. When car trouble sends a fresh-faced young woman—straight and married—their way, Liz makes a bet with her gal pals that she can woo the straight woman into her bed. That the bet doesn’t come back to bite Liz is a little frustrating, but it is refreshing to see a woman in the role of the chest-pumping, challenge-taking man. The director, Fina Torres, who adapted the script from a play, told the audience that making a film about lesbians in Venezuela was a challenge. The Venezuelan audience, she said, assumes that an actress playing a lesbian must really be a lesbian. This was going to present a casting challenge, Torres thought, but she was pleasantly surprised at the actresses’ willingness to take on the parts. She noted of all the actresses, only Velasquez is a lesbian in real life, and is only recently out. Torres said that when her film first screened in Venezuela, some audience members stormed out, aghast at the scenes depicting a woman kissing another woman. The scenes are arguably “tame” and Torres even pointed out she wasn’t setting out to make a Venezuelan version of the risque “Blue is the Warmest Color.” Lesbian love scenes aside, “Liz in September” is a beautifully shot film that could double as a promotional campaign for visiting Venezuela. It’s one of many stops on the global story-telling tour that departs from within the cinemas in Palm Springs in January. When Is The Tedium Just Too Tedious? I didn’t know much about the film “Chronic” before sitting down to see it here at the Palm Springs International Film Festival. I knew it starred Tim Roth, who can currently be seen staring down adversaries in “The Hateful Eight.” After walking what appeared to be a “walkable distance” from another location (it was not), I didn’t much care what it was about; I was just glad to finally be sitting down. “Chronic” was written, directed, and produced by Michel Franco and made its debut at the Cannes Film Festival in 2015. The film follows the days and sometimes nights of Roth’s character, a home health care nurse, as he lifts, feeds, and bathes patients dealing with a host of debilitating ailments, ranging from the frustrating immobility of a recent stroke to the haunting effects of chemotherapy treatments. And when I say it follows him lifting and feeding and bathing his patients, I don’t mean that it shows snippets of such activities in order to give us a primer on what he does. Instead, the film shows the tedium of these dignity-destroying scenes nearly in real time, or at least what feels like real time. It reminded me of watching the characters in Michael Haneke’s “Amour,” as the husband helps his struggling wife get from one side of the room to the other, and we the audience watch nearly every painstaking step. These scenes can illustrate for the audience just how long it takes, just how much patience it takes, to accomplish what would have otherwise been quick and efficient tasks. They can invoke empathy and understanding. But at what point is it just tedious? At what point do you say…okay, I get it, now get on with it? “Chronic” takes its time setting up Roth’s day-to-day. There is no point at which the plot then switches to something else. It’s not as if the first act is setting up that Roth is a home health care nurse before he robs a bank or before he gets carjacked. His job is part of his backstory, or perhaps a result of it, and it’s what will ultimately contribute to his fate. And the long, seemingly monotonous scenes lull the audience into thinking there’s not much more… until the film slaps you across the face and pummels you like a rag doll with its loud gasp-provoking final scene. It’s an ending that you will either find brilliant or infuriating, or both, but tedious it is not. 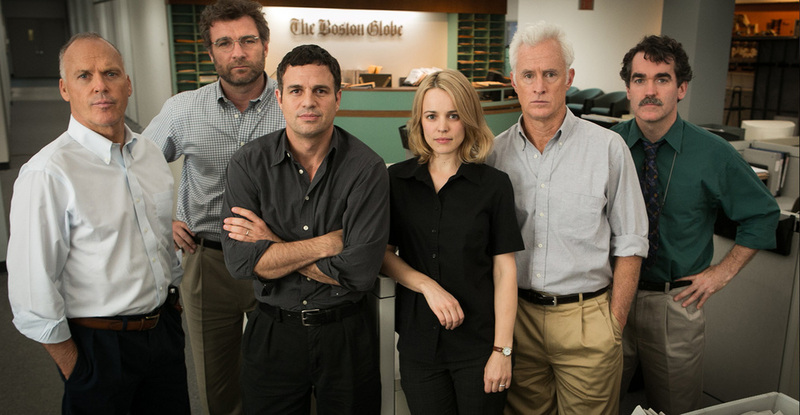 The film "Spotlight," the true story about an intrepid group of Boston Globe newspaper reporters working to uncover and expose the Catholic priest abuse scandal, was named Best Picture and Best Screenplay by the Los Angeles Film Critics Association over the weekend. This wasn't the first award and won't be the last for this fine film. It seems to be universally respected. I'm a huge fan of Tom McCarthy who co-wrote and directed this film. I've raved about "The Visitor" which I argue is required reading and viewing for all aspiring screenwriters. "Spotlight" feels like a low-boil crime thriller, with a who-dunnit mystery with three facets: who did the crime, who covered it up, and who looked the other way? The film shows the painstaking, meticulous, patience-trying work behind the expose. They pound the pavement, they hunt through the archives, they make copies and phone calls and spreadsheets. It doesn't exactly sound like edge-of-your-seat stuff, and yet it is. And you care. You care about the phone calls, the copies, and the spreadsheets and you care about the people making them. And if that isn't a lesson for writers and filmmakers, I don't know what is. Are You an Amateur Writer or an Undiscovered Writer? Story Analysts, such as myself, often use the work "amateur" when writing about or discussing scripts. "This reads like an amateur script..." Or, "Such-and-such is clearly an amateur writer." So, do we mean this in the pejorative sense? Generally, yes. Is that fair? Probably not. While "amateur" can mean someone who isn't getting paid to write, or hasn't landed representation, "amateur" is often used as a shorthand to denote work that doesn't look or read like a professional script. There's something about it, maybe it's clunky exposition or incorrect formatting, that doesn't pass muster. But sometimes writers who are not getting paid to write or haven't landed representation write well enough to pass their work off as professional. I consider these writers "undiscovered." There's nothing pejorative about that. It actually sounds quite hopeful and full of possibilities. So, are you an amateur writer or are you undiscovered?